The Keysight 33220A is available to buy refurbished used or rent, usually from our UK stock. Click here to download the Keysight 33220A datasheet. The 33220A can generate variable-edge-time pulses up to 5 MHz. With variable period, pulse width, and amplitude the 33220A is ideally suited to a wide variety of applications requiring a flexible pulse signal. Use the 33220A to generate complex custom waveforms. With 14-bit resolution, and a sampling rate of 50 MSa/s, the 33220A gives you the flexibility to create the waveforms you need. It also lets you store up to four waveforms in nonvolatile memory. Front-panel operation of the 33220A is straightforward and user friendly. You can access all major functions with a single key or two. The knob or numeric keypad can be used to adjust frequency, amplitude, offset, and other parameters. You can even enter voltage values directly in Vpp, Vrms, dBm, or as high and low levels. Timing parameters can be entered in Hertz (Hz) or seconds. Internal AM, FM, PM, FSK, and PWM modulation make it easy to modulate waveforms without the need for a separate modulation source. Linear and logarithmic sweeps are also built in, with sweep rates selectable from 1 ms to 500 s. Burst mode operation allows for a user-selected number of cycles per period of time. GPIB, LAN, and USB interfaces are all standard, plus you get full programmability using SCPI commands. The 33220A external frequency reference option lets you synchronize to an external 10 MHz clock, to another 33220A, or to an Agilent 33250A. Phase adjustments can be made from the front panel or via a computer interface, allowing precise phase calibration and adjustment. 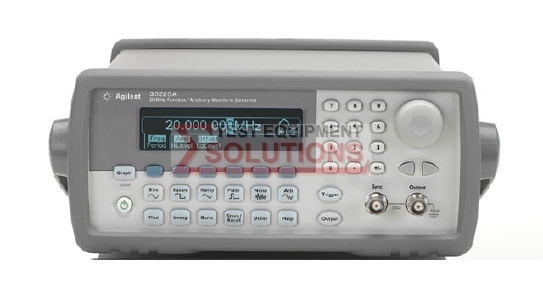 We offer the refurbished used Keysight (Agilent) 33220A 20MHz Function/Arbitrary Waveform Generator for sale and rental. The Keysight 33220A is fully tested and refurbished in our in-house ISO9001 calibration laboratory. We supply manuals, accessories, full warranty and a free-of-charge Certificate of Conformity. We can also provide the Keysight 33220A with a fresh calibration for a small additional charge. If you have under-utilised test equipment talk to us about trading-in or part-exchanging it towards the Keysight 33220A or other refurbished test equipment.